This wide view, acquired on October 14, 2018, by the Landsat 8 satellite, shows the area where part of the rectangular iceberg was photographed from NASA’s DC-8. The sharp-angled iceberg that made headlines in late October 2018 had a longer, rougher journey than was initially thought. Not only were the edges of the iceberg extremely straight, but the two corners appeared “squared off” at right angles. The berg was so clean-cut that it was reasonable to assume it might have very recently calved from the Larsen C ice shelf. That’s the same ice shelf that spawned A-68, the trillion-ton iceberg that broke away in July 2017. It turns out, however, that the rectangle berg actually has had a much longer journey. Scientists used images from Landsat 8 and the European Space Agency’s Sentinel-1 to trace the berg back to its origins. They found that it calved from the ice shelf’s new front in early November 2017, just a few months after A-68 broke away. The image below, tweeted November 9, 2018, by Stef Lhermitte of Delft University of Technology, shows the small, newly calved icebergs. The rectangle iceberg—which was about 4 kilometers long at the time—appears just north of a curved berg. 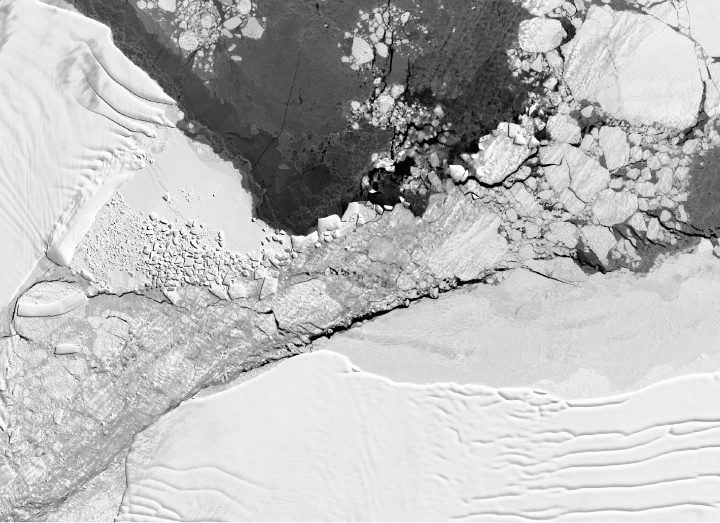 Both were about a third of the way down the new front of the Larsen C.
The rectangle berg then began a northward journey, navigating the newly open water between the Larsen C ice shelf and Iceberg A-68. Collision threats were everywhere: A-68 could smash into the little bergs at any time, and smaller bergs could collide with each other. The berg cruised all the way north and through a narrow passage between the A-68’s northern tip and a rocky outcrop near the ice shelf known as Bawden Ice Rise. NASA/UMBC glaciologist Chris Shuman likens this zone to a nutcracker. A-68 has repeatedly smashed against the rise and caused pieces of ice to splinter into clean-cut geometric shapes. An area of geometric ice rubble is visible in the Landsat 8 image (top and below) from October 14, 2018, two days before the IceBridge flight. The once-long rectangle berg did not make it through unscathed; it broke into smaller bits. The iceberg in Harbeck’s photograph, circled in the annotated Landsat 8 satellite image, appears closer to the shape of a trapezoid. 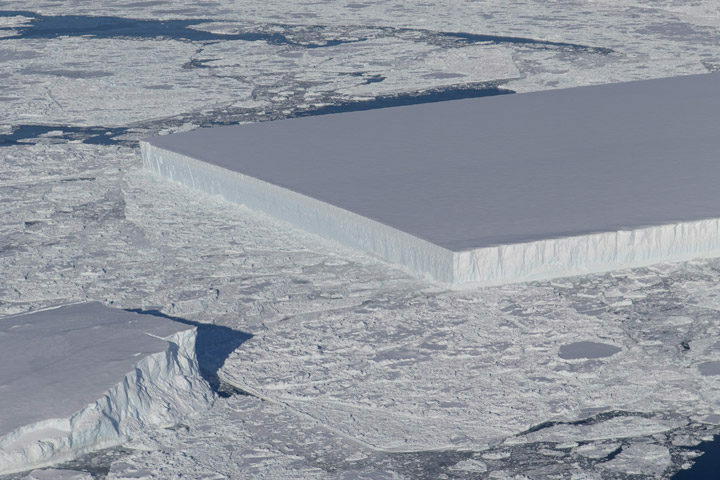 The trapezoidal berg is about 900 meters wide and 1500 meters long, which is tiny compared to the Delaware-sized A-68. This entry was posted on Monday, November 5th, 2018 at 11:23 am and is filed under Ground to Space. You can follow any responses to this entry through the RSS 2.0 feed. You can skip to the end and leave a response. Pinging is currently not allowed. So how far had the ice berg traveled when it was spotted Oct. 16 of this year?